At the time of Aegon’s Conquest, the Tyrells were nothing more than stewards to the Gardener Kings. Raised to lordship when the last of the Gardeners were burnt to ash on the Field of Fire, House Tyrell has grown from humble beginnings—and their ambitions stretch far higher. The lands of the Reach are famed for their bounty, the Tyrell knights are paragons of chivalry and virtue, and Highgarden is known as a place of light, beauty, and song. Yet there are hidden thorns beneath the golden rose of House Tyrell, and the intrigues of House Tyrell may be as devious as any Lannister scheme. House Tyrell surges into the light with their deluxe expansion, House of Thorns! 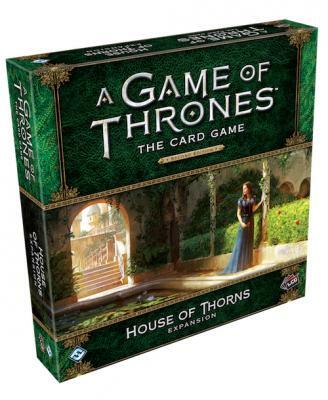 Within this box, you’ll find a wealth of new cards, bringing powerful new options to support and diversify House Tyrell’s most important themes, such as increasing the STR of their characters, removing characters from challenges, and winning challenges with the Knights and Ladies of Westeros. You’ll also find plenty of iconic characters sworn to House Tyrell entering the game, including Mace Tyrell, Brienne of Tarth, the Queen of Thorns, Margaery Tyrell, and the Knight of Flowers.